Times of Aryan n Khushi: The Historical Pic ! 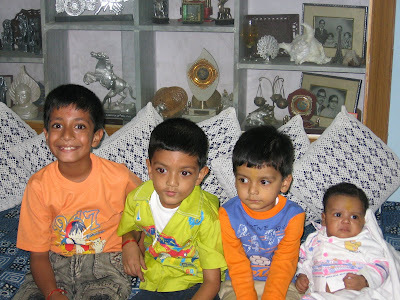 This is Aryan's Picture with all his first cousins(Prakhar,Pallav,Anirudh and Aryan).It was Aryan's First Diwali and Aryan was exactly 3 month's old that day(No plus-minus).He did not know to sit till then.I wanted a picture of four of them. And this is the one !!! Look at the pic and you will notice that all the four kids have four different expressions and they look in different directions :)Aryan was given support at the back from a hand(his taiji's). I am standing behind the camera to entertain him and his papa was clicking. Chai chapa chai..Chappak chai ! A Few Precious Pics !